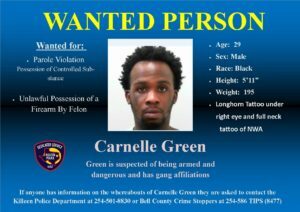 Killeen Police need your help locating 29 year-old Carnelle Green of Killeen. Green is wanted for Parole Violation and Unlawful Possession of a Firearm by a Felon. Do not attempt to apprehend this wanted person yourself, as he is considered ARMED and DANGEROUS. Detectives are asking anyone who has information on Carnelle Green whereabouts to contact Crime Stoppers at 526-TIPS (8477) or go online anonymously at www.bellcountycrimestoppers.com. You can also download the app P3 tips on IOS and Android phones. All information is anonymous and confidential and if your tip leads to the arrest of this person, you could be eligible for a reward up to $1,000 in cash.